We here in the UNLV Public History Program are proud of our alumni and the amazing things they have accomplished. This is a page dedicated to them and their work, highlighting the integral role the study of public history plays in their careers and lives, regardless of what paths they take. Part blog, part autobiography, these posts feature stories about the many transferable skills these historians developed as students of public history at UNLV. In 2011 and 2012 when I was studying history as an undergraduate at Washington State University, I worked in the university’s Manuscripts, Archives, and Special Collections. I learned a lot about basic archival processing, digitization, writing for a public audience, and I also learned how to use archives as a historical researcher. As an undergrad, I also had the opportunity to co-curate an exhibit in a class that examined the history of the Greater Columbia Plateau. This course was taught by environmental historian Jeffrey C. Sanders, and when I was considering continuing my education in graduate school he recommended that I apply to the University of Nevada, Las Vegas particularly because of UNLV’s public history program. I came into UNLV’s master’s program in 2013 knowing that I did not want to be an academic historian—I wanted to be a public historian (although when I started I wasn’t sure exactly what that meant). My previous experiences in exhibit curation and archival work showed me that I wanted to do research and projects for communities—projects that highlighted the work, struggles, and lives of peoples often left out of or erased from the historical record. As a graduate student at UNLV, I not only learned how to think, research, and write like a historian, but I also learned how to curate exhibits, write for a general audience, and collaborate with community members. The UNLV public history program worked closely with Culinary Union Local 226, UNLV Special Collections & Archives, and the Nevada State Museum to create an exhibit that traced the history of the Culinary Union and the union’s influence on the labor movement in Las Vegas. Professor Deirdre Clemente guided me and my classmates expertly through the logistical, interpretive, and political challenges. I learned more working on this exhibit than I could have imagined—I learned how public history means serving the needs of donors, communities, and cultural institutions; how it’s entirely collaborative and interdisciplinary; and how curating can be equal parts frustrating, exhausting, and inspiring. Photo of the exhibit Line in the Sand: The People, Power, and Progress of the Culinary Union in UNLV’s Lied Library. Photo by L.E. Baskow published in the Las Vegas Weekly. I also had the opportunity to work in the UNLV Special Collections & Archives while earning my master’s degree. I started as an Archival Intern in 2014 updating and enhancing finding aids that describe archival materials and assist researchers in finding the primary sources they need. I continued at UNLV Special Collections for the duration of my master’s degree as an Archival Assistant working on various projects in the Technical Services department. After graduating in 2016 I was hired as Lead Processing Archivist to work on a National Historical Publications and Records Commission grant project, “America’s Great Gamble: A Project to Promote the Discovery of Sources About the Expansion of Legalized Gambling Across the United States.” Working in the archives brought together my interest in history and my passion for historical work that benefited and served the public. My perspective as a public historian allowed me to be able to critically examine archival materials and understand how historical researchers may use archival collections. Also, I used my subject expertise to make recommendations about how the collections should be preserved, especially with regards to cultural sensitivity of the cultures represented in the materials. While doing the NHPRC grant project I realized that I wanted to continue to pursue a career in the archival profession. I decided to apply for a second master’s degree in library and information science and was accepted at the University of Washington in Seattle. I am in a funded assistantship position working for UW’s Information School and am now almost finished with my first year of the two-year MLIS program. My current research focuses on community-based archiving and exhibition methods. In particular I am interested in how these methodologies can be used to make archives more inclusive. I also have the great opportunity to learn more about Indigenous knowledge systems and have been doing a lot of research about archival reconciliation projects with Indigenous peoples in the US, Canada, and Australia. Archives can begin to reconcile their role in colonization by empowering marginalized communities to create their own archives, reevaluating and returning materials that were stolen from Indigenous peoples and do not belong in archives, and forming stronger community bonds through reciprocity—ensuring that communities receive something in return. By increasing transparency, treating community members as partners, and engaging in collaborative collecting initiatives that meet community needs, archives can take real steps towards reconciliation and decolonization. 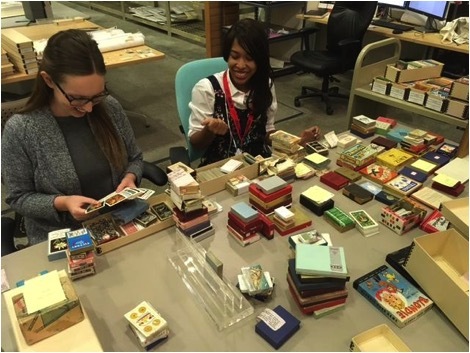 Hannah Robinson and her colleague Hana Gutierrez working on the Harrah’s Entertainment Corporate Archives, a collection processed during the NHPRC project grant. In addition to being a student I also work in UW Special Collections improving finding aids, processing collections, and accessioning new archival materials. I am set to begin as a Curatorial Assistant in the Labor Archives of Washington (a unit within UW Special Collections) this summer where I will be working on an exhibit about the Seattle General Strike of 1919. I’m really looking forward to returning to public history focused work and am thankful that UNLV prepared me to be a good researcher and think like a public historian. My time as a student at UNLV set me up for a successful career as an archivist and public historian. I think I still might be learning what exactly it means to be a public historian but at the moment, to me it means writing and researching about topics that matter to communities today, collaborating with community members, and serving as a venue to elevate underrepresented and marginalized voices. Leisl Carr Childers with Tamsen Hert (University of Wyoming Special Collections) at the 2016 Spur Award banquet. I arrived in Las Vegas and entered UNLV’s doctoral program in History in the fall of 2005. One of the first things a graduate student in the program asked me was whether or not I was going to be doing public history. All I knew about the field was what my mentors had told me, so I told him no, I wasn’t. He levelled a look at me and asked me if I wanted a job. That made me pay attention. What I didn’t understand at the time, but soon came to realize is that public history was the pathway for me to be a better historian. My first job at UNLV was on the Nevada Test Site Oral History project and the work really put me through my paces and caused me to pay attention to the Great Basin’s history, a place often ignored. Besides adding a wide array of interdisciplinary skills to my repertoire, including oral history interviewing, transcription, and editing, the project required me to manage my time more closely and work collaboratively with other groups on campus such as the digital librarian and special collections archivist in Lied Library. These skills changed the way I approached my research and writing, widening the ways in which I interacted with historical sources and crafted interpretations. Leisl Carr Childers presenting the opening of the Fortepan Iowa digital archive. March 25, 2015. In addition, my participation on the project fundamentally changed the shape of my research career. My mentors encouraged me to make use of the work I had been doing on the NTSOHP with ranchers and radiation monitors and reshape my dissertation project. Coursework that ranged from content and historiography to cultural theory and public history practice provided me with an excellent platform from which to approach the topic of Great Basin history. My mentors gave me plenty of room to be creative and opportunistic throughout the process. The collaborators of Fortepan Iowa - left to right: Sergey Golitsynsky, Leisl Carr Childers, Bettina Fabos, and Noah Doely. Fortepan Iowa opening. March 25, 2015. The path the project set me on has led me to some very unexpected places. I have published a monograph on the subject, which won the Western Writers of America Spur Award in Contemporary Nonfiction in 2016, and worked with history centers, including the Rural West Initiative at the Bill Lane Center at Stanford University, the Center for the American West at the University of Colorado-Boulder, and the American West Center at the University of Utah. I have also worked with reporters from the High Country News, Washington Post, and PBS’s Frontline. In 2005, I could not have imagined doing any of these things. But, because of the opportunities afforded me in the public history program at UNLV, I was able to put together a set of skills and resources that launched my career as both an academic and public historian. There was no better place for me to train for my future career.